The SNS and SQS services offered by AWS are great messaging services and play well with Lambda, but when it comes to messaging, it takes two to tango. What if you are working with Customers, Vendors, Partners or other external entities that already have an established messaging platform? The onus may very well be on you to integrate into their platform of choice. If you’re lucky they are using RabbitMQ. RabbitMQ is a modern Messaging Broker built on the new AMQP protocol and championed by Pivotal. It offers many advantages over older messaging systems such as JMS (IMHO) and is gaining in popularity. 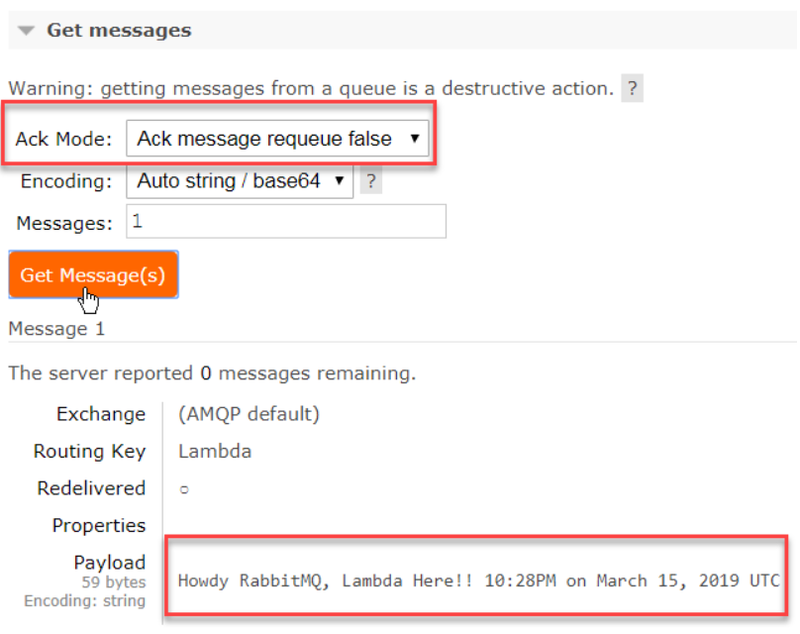 AWS Lambda functions can publish messages to RabbitMQ, and this post will present a simple example. This post is designed for people familiar with AWS Lambda using Python, but new to RabbitMQ. 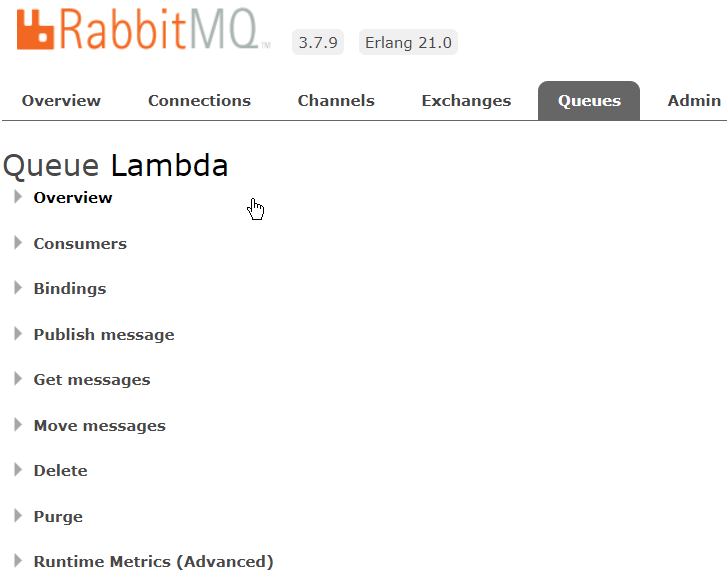 The only thing better than on premise RabbitMQ is RabbitMQ hosted in the cloud. CloudAMQP has you covered. Once you’ve signed up, the Instance detail page will show you your hostname, user and password. That’s all you need to connect to your instance. Pika is a pure python AMQP client listed on the RabbitMQ site. I’ve created a Lambda Layer with it in us-west-1 and made it accessible to all AWS accounts. Continue here in us-west-1 if you’re able, or I can put the layer into other regions if you post a request in the comments. Okay, getting close now! Create a new Lambda Function from scratch with the Python 3.6 runtime and an execution role that gives the function access to AWS Key Management Service and Amazon CloudWatch Logs. Save the Function, create a Test Event, and Test! A message should have been published to RabbitMQ. 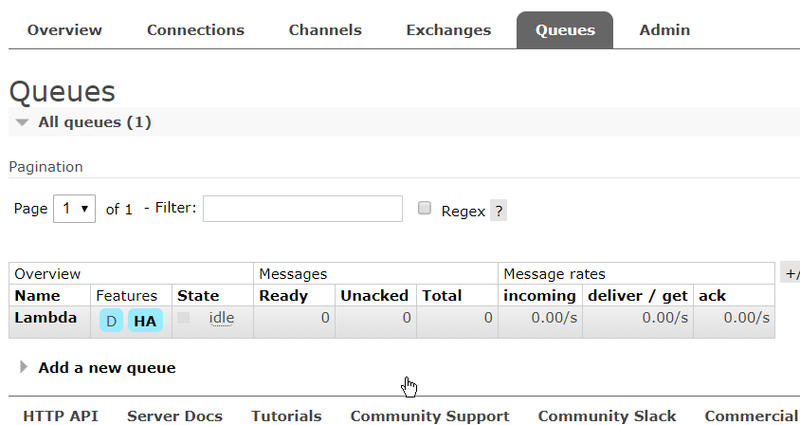 Expand the Get Messages section, change the Ack Mode to Ack message requeue false and click the Get Message(s) button. The web console pulls the message from the Queue and displays the body! Hopefully your message made it to the Queue and you were able to get it. If not check your Lambda execution results, Pika gives pretty descriptive errors. If you’re still not able to get it working, post a comment and I will do my best to help. In my next post I will show you how to consume a RabbitMQ message from a Lambda Function. The code sets the connection to use SSL/TLS to protect the message contents and the instance password. This appears to be working with the developer only having to set a flag to True. This is a testament to the quality of both AWS and CloudAMQP. When working with on premise messaging, I like to confirm the encryption by using a proxy or checking with my friendly (hopefully) networking team. Being in the cloud makes this a bit trickier. Check with your cloud providers to confirm your messages are encrypted before putting sensitive information in your messages. If you think your RabbitMQ instance password may be compromised, change it.